It’s always lovely to visit a beautiful modern garden, isn’t it? They’re so structured, neat and peaceful. 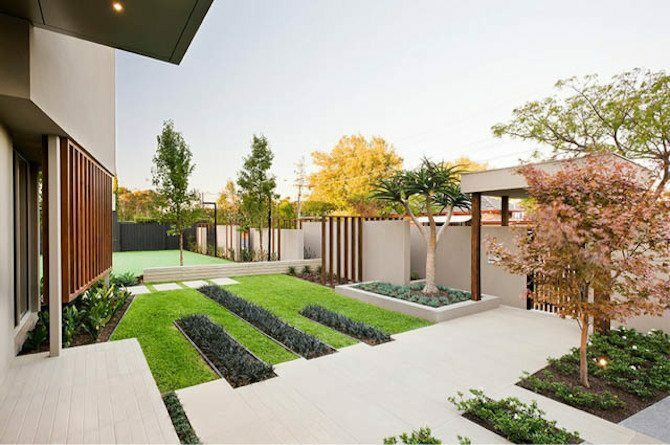 You gaze with envy at the display home’s shade, placement of plants and trees, places to sit, steps and swimming pool. You feel uplifted and inspired. … you come home to your own overgrown yard filled with weeds, ant nests, fallen branches, bits of timber, unfinished projects and other items of clutter. And even if you have the budget to transform your yard into something like the one you visited, you can barely remember all the subtle details that made it so appealing. You were too busy getting lost in the wonder! Whether you have the budget available now or you’re keen to start saving your pennies, we’ve put together the 16 best modern garden ideas to inspire you to garden greatness! You’ll notice a lot of them feature a completely grassless yard altogether, no doubt to avoid ever having to undergo that exhausting chore of mowing again. Weeding has also become a thing of the past, with this pest blocked by stone, tiles, timber floors, pebbles and concrete. Those who’ve opted to keep their greenery are clearly dedicated to more regular maintenance, but modern gardens will never get out of control like other suburban jungles. Having said this, the pools, steps and outdoor furniture (including sofas with cushions) will definitely need to be looked after to survive outside in the elements. Hard work aside, no-one will ever regret calling one of these beautiful, contemporary gardens their own. Most of the yard area in this example has been covered in stones and a lovely foot path. Garden areas are in controlled corners and edges. These residents value water conservation. They even have a supplemental rain water capture system saving them from having to waste water from the hose. 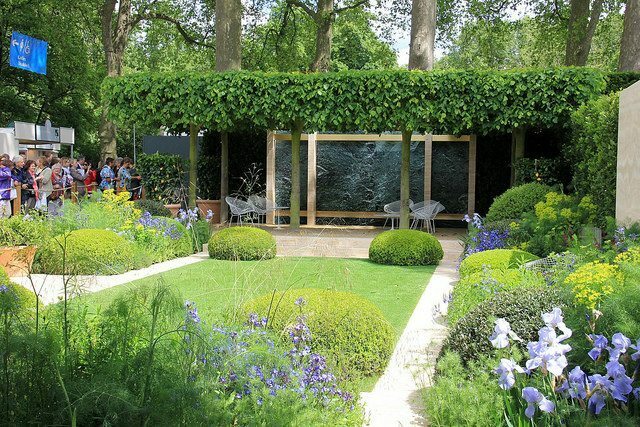 This award winning garden oozes peace and relaxation, and cleverly combines classical Italian with a modern edge. On this particular occasion, a rope fence was erected to prevent the many tourists (pictured) from trampling on the perfect grass and carefully sculpted plants. 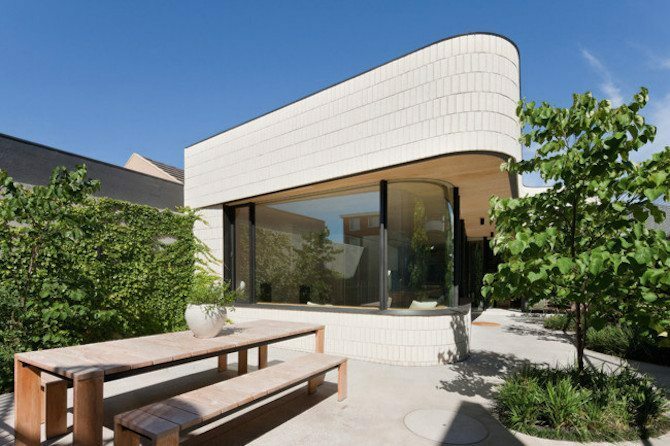 The simplicity of this garden is designed to keep the viewer’s focus on the architecture of the home. It also serves as a functional entertainment area. 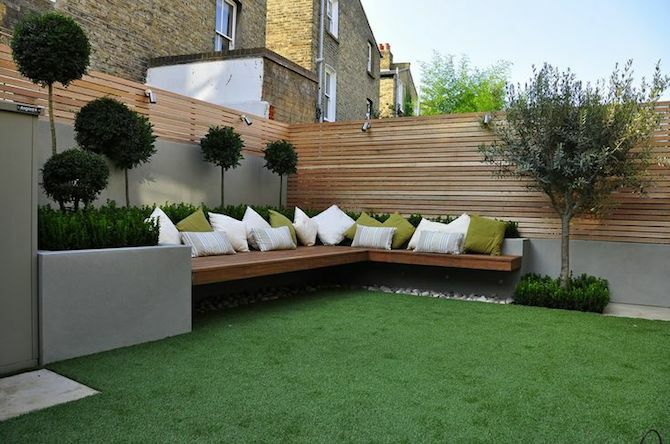 This garden by designer My Landscapes looks more like a room without a ceiling. Decking and tiling on the ground replaces the dirt and grass of traditional yards. The waterfall acts as a focal point, cedar cladding adds privacy while tiles add an extra edge to the traditional understanding of ‘outside’. 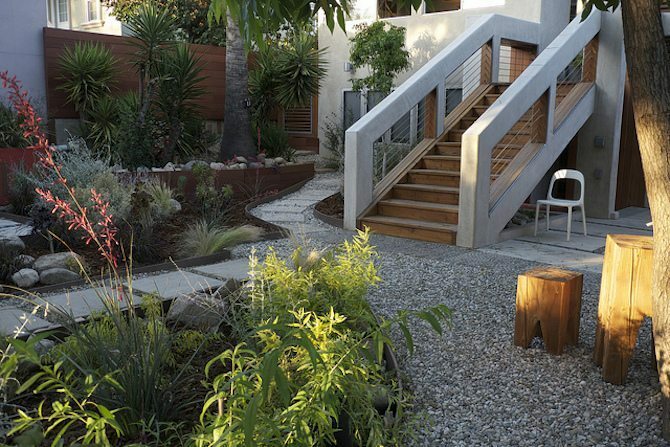 Bamboo, Japanese maple, Mexican lilies and Indian bean trees provide low maintenance greenery. More tiling and steps here, but with just enough grass to sit or lie down on. When it comes to mowing, it’ll take you about 2 minutes if that. Hedges are there to make the walls look more attractive. Plenty of sharp, unique lines combine with complementary, subtle colors from nature to create a hop, skip and a jump to all areas of this COS Design landscaped property. 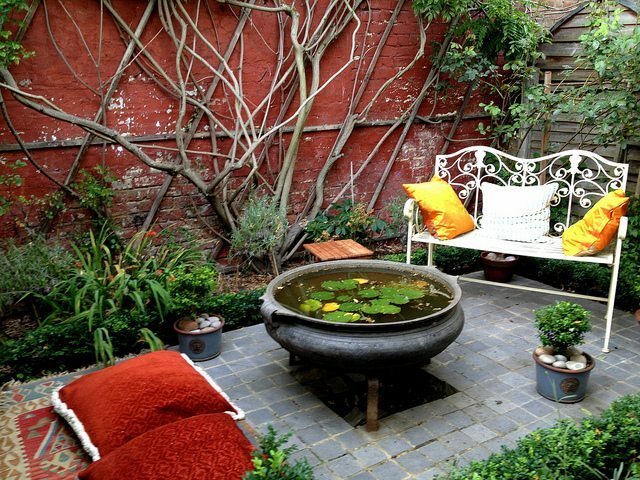 A simple idea involving some paving, a small pond, some furniture and a few cushions, making what might otherwise be a dark, dreary little urban garden into a quaint resting area. 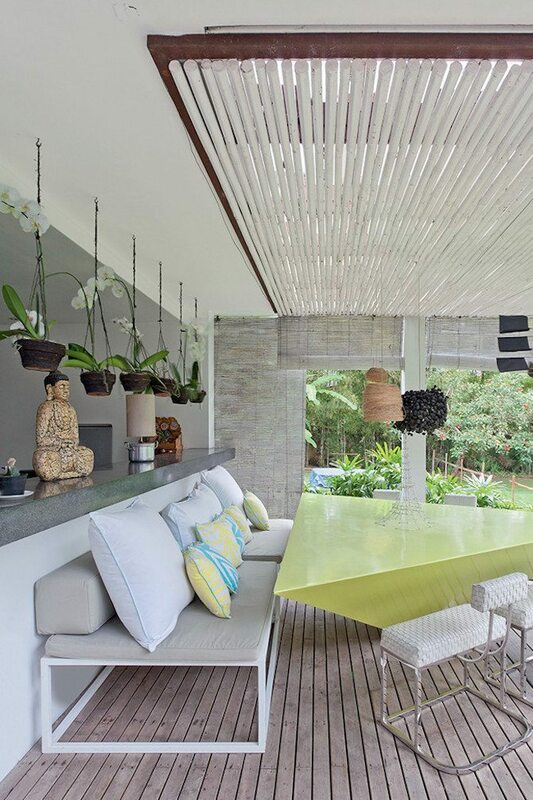 This stylish alfresco deck uses a fresh, contemporary color palette that reflects the natural environment. Green and white plants match a green and white table setting. White washed timber blinds invite light and a spirit of joy and calm. I swear this garden design has to find itself side by side with a river or sea. The person who owns this masterpiece has to be an outdoor type through and through. 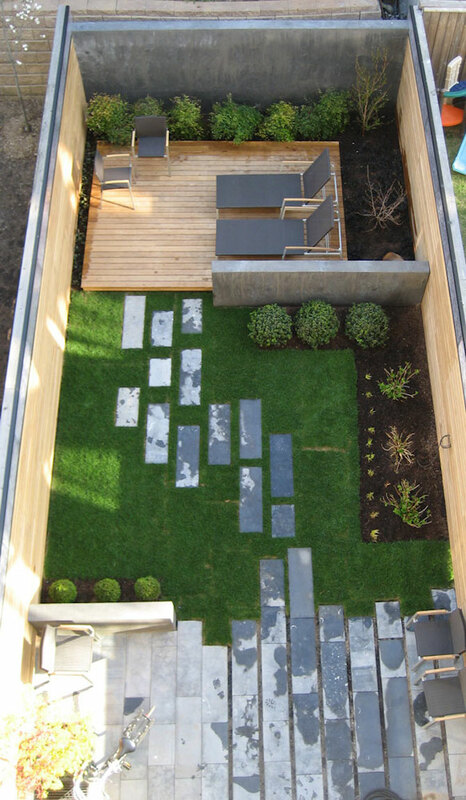 This garden neatly combines concrete, decking, steps and some very precise rectangular areas of greenery for contemporary class. 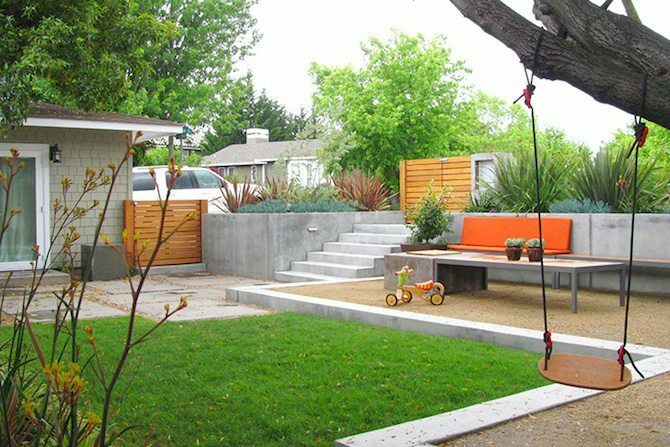 Small spaces can contain a good balance of concrete, wood and grass areas, but only in small doses of course. Here, there is plenty of play space for the kids as well as relaxing and flat walking areas for the grown ups. 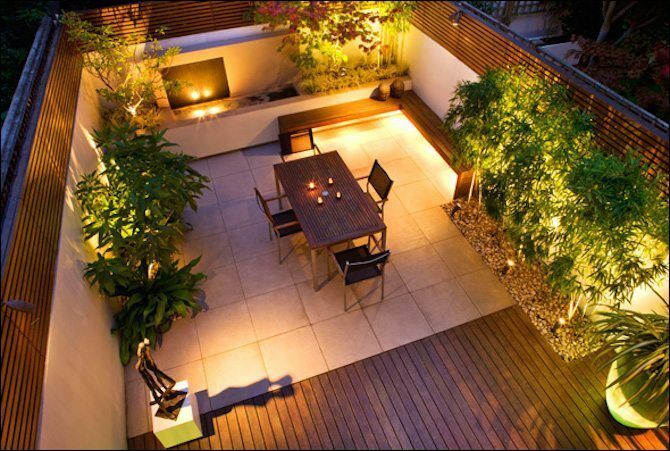 Impressive use of retaining walls add to the creative charm of the Montreal Outdoor Living design. Don’t step on the nice grass! Use the stepping stones leading from one gorgeous timber deck area to another. You don’t need to be on a second story to enjoy this stunning modern deck design by City Beautiful Carpentry. This is certainly modern! One might even say it’s futuristic! 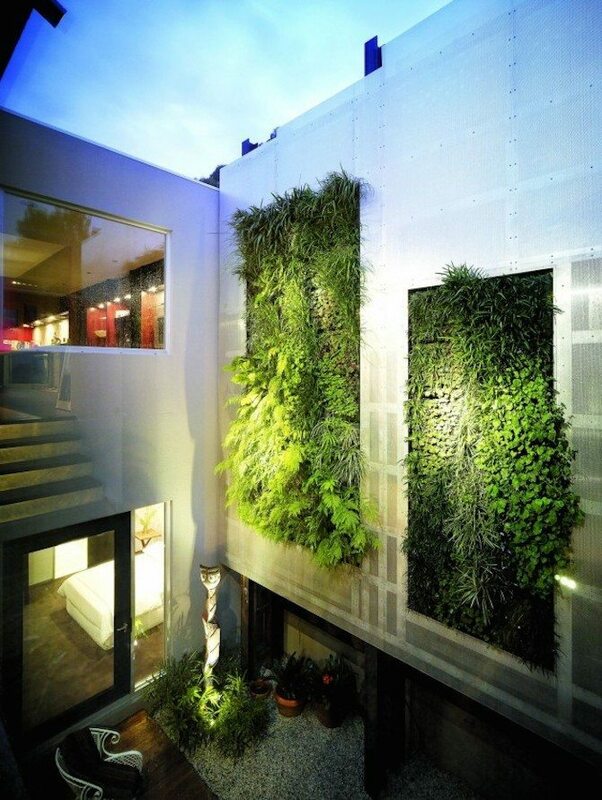 This design takes the concept of building up and strategically places plants into the wall. What a great use of space! Why don’t we see more of this? Jazz up a potentially stark concrete fence wall with a piece of fence art. COS Designs knows how it’s done. Alternatively, choose an inspiring image from the Canvas Factory gallery of over $20 million images and create a metal print! A brushed aluminium print, suitable for outdoor areas, will look simply stunning. 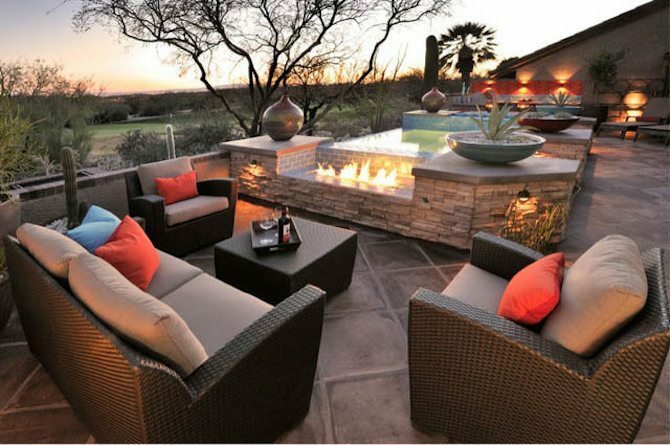 With a huge fireplace, dining area, a full lounge area with couches and a coffee table (not to mention the combined pool and spa), this is indeed an outdoor living room. 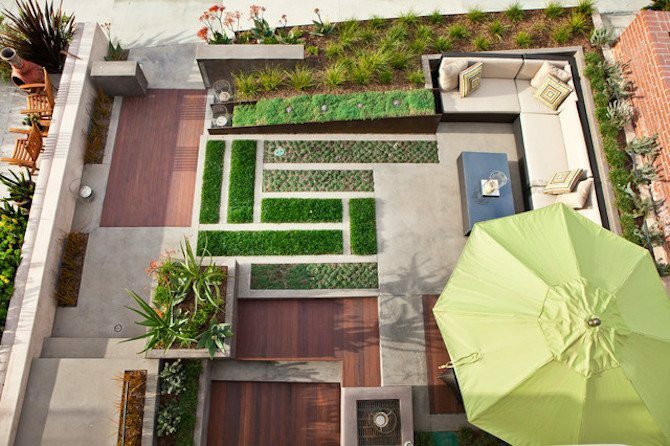 A simple, yet sophisticated flat grassy yard from Harrington Porter, with neatly placed plants and furniture. Lots of open space with a comfortable cushioned bench seat, ideal for relaxing reading. This is Bali with all the function and none of the fuss. Some interesting levels here lead up to a comfortable shaded lounge area. 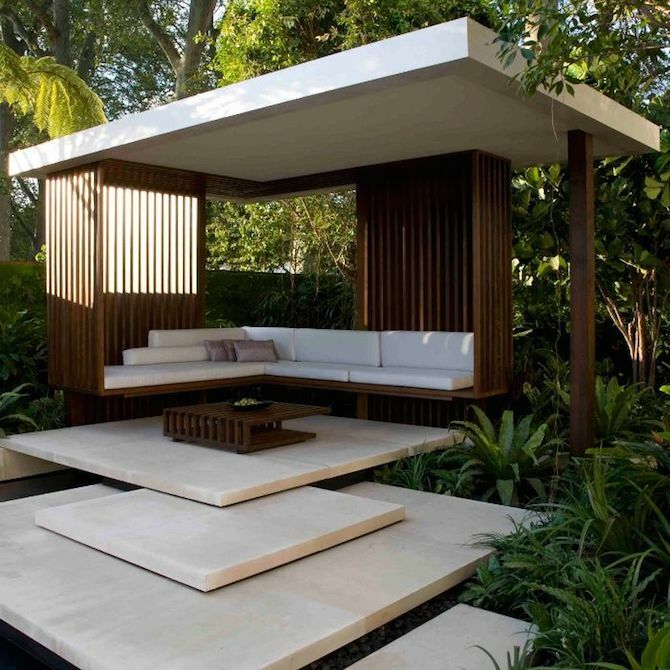 Surrounded by jungle-like greenery, it provides a relaxed, outdoor relaxation area among nature while being easy to keep clean! 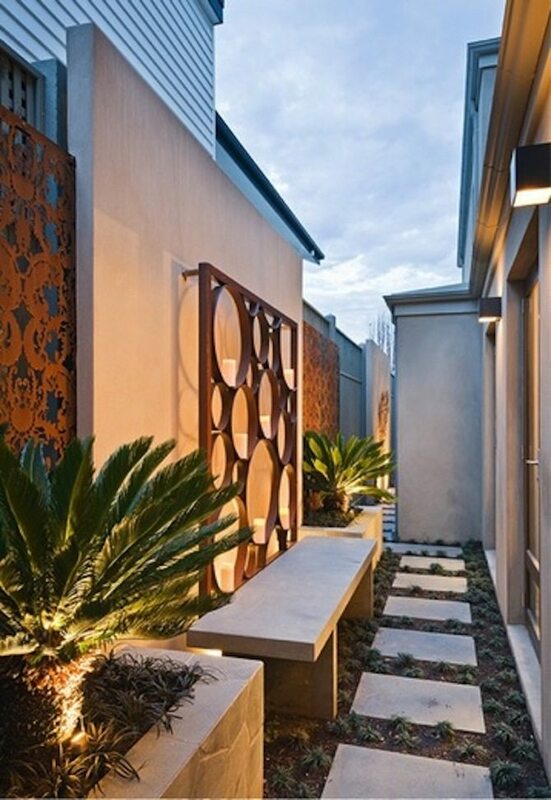 A modern outdoor beauty from Landform Consultants. 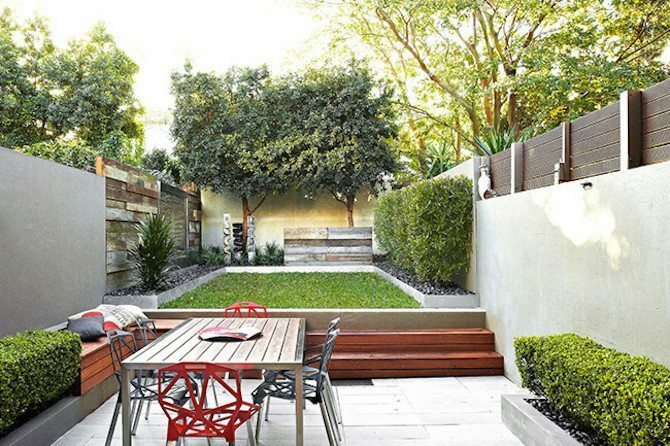 It’s time now to contact a landscape architect or roll up your sleeves and get into it DIY style. Why not document the process? Take some photographs of the old, document along the way and then, once it’s complete, take some photos of the incredible result. To honor all that hard work, create a canvas collage to show the before and after. Creating something as beautiful as this is certainly something to take pride in.